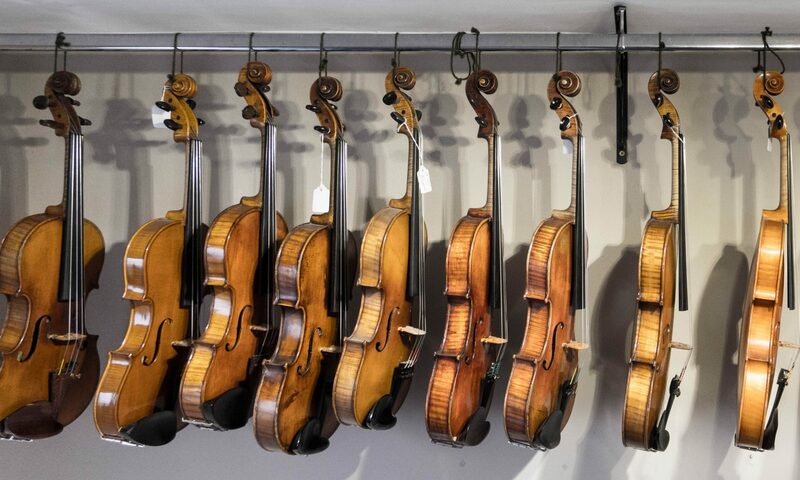 Beginners & advancing students are also catered for with violin, viola and cello outfits. Wittner Fine tune pegs fitted. Benedict Lang 1986 Workshop. Full size, in great condition, set with a Belgian style bridge and Jarger strings. Inexpensive for great sounding well made German quality. Lionel Karl Hepplewhite 16” 1987. Excellent work by this regarded contemporary maker. Beautifully clear and powerful tone. Immaculate condition. William Piper 2014, 15 1/2 ” Collin-Mezin model. Beautifully figured tone wood. Excellent condition. Delightful German viola, lovely figured tonewood. Chinese workshop 16” Lovely antiqued varnish. Professionally set up. Silver Mounted Viola BOW stamped Ubel. 16 1/2 ” Delightful VIOLA with antiqued finish, Professionally set up. Great upgrade for advancing students. Lovely English violin circa 1850’s. Big warm sound with great projection. Beautiful violin by Cremona gold medalist Christopher Rowe 1988. Authentic antiquing and rich, warm varnish. Exquisite and powerful tone used professionally for both live performances and recording. John Masters, Lovely example of English work. Dartford 1887. Beautifully warm ‘Italiante’ varnish over a golden ground of choice tonewood. Big, warm and sonorous sound. Corbinian Hornsteiner, one of a dynasty of fine makers, a truly fine example in excellent condition. Award winning Christopher Rowe 1992. Authentic light antiquing, beautifully warm varnish. Exquisite and powerful tone. William Glenister London 1899. Beautiful warm ‘Italiante’ varnish over choice tonewood. Bohemian circa 1890’s Lovely Patina and character. Karl Harry Bachmann 1957 Excellent condition. John Watkins Argoed, Wales No 7 1980 Distinguished Welsh maker. Exceptional condition. ”Fournier” French workshop. Crisp craftsmanship. Sweet and sonorous. Hungarian, antique finish. Great sound. French Workshop ”Antonio Martello” Faubourg Saint Martin, Paris 1902. A delightful trade instrument in great playing condition.